Inspired by planets and moons orbiting through the stars of another galaxy, the Physics Sputnik Ceiling Lamp by Zuo Modern illuminates your contemporary living space in artistic brilliance. Despite its minimalist design, this modern ceiling lamp delivers astronomical style with 25 bulbs sprouting from a central sphere in all directions and at various lengths to deliver optimal light that resembles the subtle twinkling of a star. The entire frame of the Physics Sputnik Ceiling Lamp is constructed from chrome for added radiance while each bulb is partly chrome-dipped to create a soft, metallic glow. Beautiful Light, perfect for dining room, a real show stopper. I would suggest ordering a box of 25 bulbs as the bulbs do go out quite a bit and with so many, you want some on hand. Is this light a plug-in swag or hardwired? thanks! 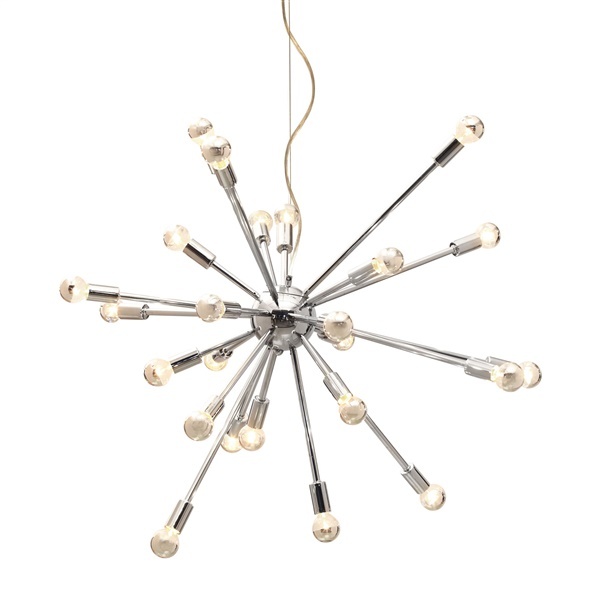 The Physics Sputnik Ceiling Lamp is a hardwired fixture only. what are the replacement bulbs for this fixture? We do not currently sell replacement bulbs for this fixture. You should be able to find them at a local lighting supply store or online. They use E12 G50 half chrome 25W bulbs. The Physics Sputnik Ceiling Lamp by Zuo Modern measures a total of 64.5" high (the lamp itself is 34.25" tall and the cord is hangs from is 30.25" long). The width of the Physics Sputnik Ceiling Lamp is 39.5" across and it hangs from a wire cord. The Physics Sputnik Ceiling Lamp does not come with a dimmer, however one may be added to the lamp after purchase.